Take I-26 West (towards Asheville, NC). Exit I-26 at #53/Upward Road and turn left (follow Carl Sandburg and Flat Rock Playhouse directional signs)* for 3 miles. (Upward Road becomes Highland Lake Road after crossing Hwy 176/Bus25/Spartanburg Hwy.) Stay on Highland Lake Road till it dead ends at Greenville Hwy, turn right. Approximate ½ mile on your right is CedarWood Inn. Take I-26 East (towards Spartanburg, SC). Exit I-26 at #53/Upward Road and turn right (follow Carl Sandburg and Flat Rock Playhouse directional signs)* for 3 miles. (Upward Road becomes Highland Lake Road after crossing Hwy 176/Bus25/Spartanburg Hwy.) Follow same road till it dead ends at Greenville Hwy, turn right. Approximate ½ mile on your right is CedarWood Inn. Take I-85 S to Spartanburg, SC and take Asheville exit to I-26 West. Exit I-26 at #53/Upward Road and turn left (follow Carl Sandburg and Flat Rock Playhouse directional signs) for approximately 3 miles. Upward Road becomes Highland Lake Road after crossing Hwy 176/Spartanburg Highway. Follow same road till it dead ends at Greenville Hwy, turn right. Approximate ½ mile on your right is CedarWood Inn. Alternative route: Take I-85 S to Shelby exit/Hwy 74. Stay on 74 through Shelby. Merge with I-26W toward Asheville. Take Exit #53/Upward Road and turn left (follow Carl Sandburg and Flat Rock Playhouse directional signs) for 3 miles. (Upward Road becomes Highland Lake Road after corssing Hwy 176/Bus25/Spartanburg Hwy.) Stay on Highland Lake Road till it dead ends at Greenville Hwy, turn right. Approximately 1/2 mile on your right is CedarWood Inn. Take I-40 West to Asheville, NC and take I-26 East. Exit I-26 at #53/Upward Road and turn right (follow Carl Sandburg and Flat Rock Playhouse directional signs) for 3 miles. (Upward Road becomes Highland Lake Road after crossing Hwy 176/Bus25/Spartanburg Highway.) Stay on Highland Lake Road till it dead ends at Greenville Hwy, turn right. Approximate ½ mile on your right is CedarWood Inn. Take I-40 East to Asheville. Take I-26E to Exit #53/Upward Road and turn right (follow Carl Sandburg and Flat Rock Playhouse directional signs)* for 3 miles. (Upward Road becomes Highland Lake Road after crossing Hwy 176/Bus25/Spartanburg Highway.) Stay on Highland Lake Road till it dead ends at Greenville Hwy, turn right. 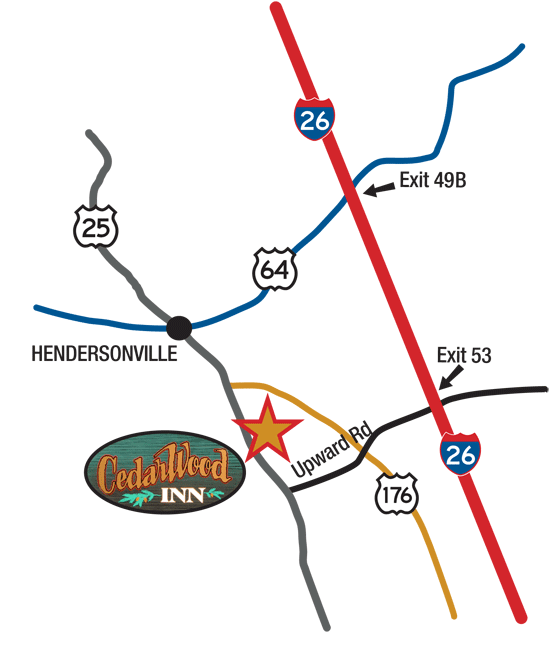 Approximate ½ mile on your right is CedarWood Inn.